Meghan Trainor has a good problem. The 25-year-old is so inspired right now that she hasn’t been able to finish her highly anticipated third album Treat Myself just yet. Although she kicked off the new era and dropped a handful of iridescent bops, the LP’s final release date has been a mystery. And it remains that way as we move into February. She opened up about the decision on Instagram last year. “I’m in such an amazing place and I can’t stop writing songs,” she gushed. “I’ve decided to move my new album Treat Myself until I get everything out of my head and recorded in the studio.” However, that does not mean she isn’t gracing us with more music while we wait. Today (February 8) the “No Excuses” diva unveiled a new EP called The Love Train to tide us over. And aside from the loved-up, needy anthem “All The Ways,” the 6-track collection is comprised of all-new music. Likely inspired by her recent marriage to Daryl Sabara, the remaining tracks are equally romantic. M-Train pulls out a ukulele and opens up about her desire to make things official with her boo on “Marry Me.” The sugary confection is too cute for words. “I don’t need a cake. A fancy wedding’s not for me. Won’t you marry me today,” she asks. Why? “Cause I love you, wanna give me your whole life.” From there, it is back to the dance floor on “I’m Down.” Considering her track record for bops, it is hardly surprising how successful this one is. Next up is piano-led ballad “After You.” On it, Meghan pleads with her beloved to never leave her side. “Please don’t go and leave me alone,” she implores. “Don’t wanna give my heart away to someone new. Won’t be anybody after you. And even if one day our time is through, won’t be anybody after you.” It makes for a restrained moment of contemplation on the jam-packed collection and contains some of the hitmaker’s best writing to date. Meanwhile “Foolish” is easily the most immediate banger. Wildly fun, it is emerging as a clear fan-favorite on the tracklist. After one listen, it is obvious why. “They say that fools rush in. But I, oh I, I wanna be foolish with you,” the pop princess coos over frantic beats. It is highly unlikely you’ll be able to resist singing along. EP closer “Good Mornin'” is a family affair. 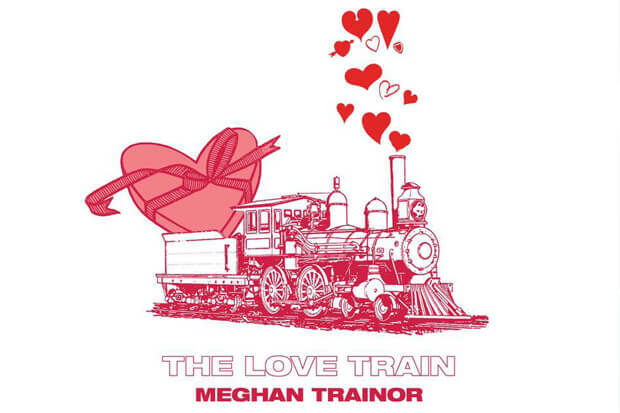 The atmospheric cut features an appearance from Meghan’s dad Gary Trainor on the organ. After featuring her mom on Thank You album track “Mom,” it is sweet to see the trend continue. Overflowing with lush production and endearing sentiment, The Love Train makes me more excited to hear what is in store for us on Treat Myself. All things considered, that alone makes it a major success. Give the EP a listen below and see if you can pick a favorite song! What is your favorite song on the EP? Let us know below, or by hitting us up on Facebook and Twitter!